Calendar of Treasury Books, Volume 20, 1705-1706. Originally published by Her Majesty's Stationery Office, London, 1952. Privy seal for 1000l. as equipage and 10l. a day as ordinary from June 24 last to Thomas, Lord Raby as Ambassador Extraordinary to the King of Prussia. 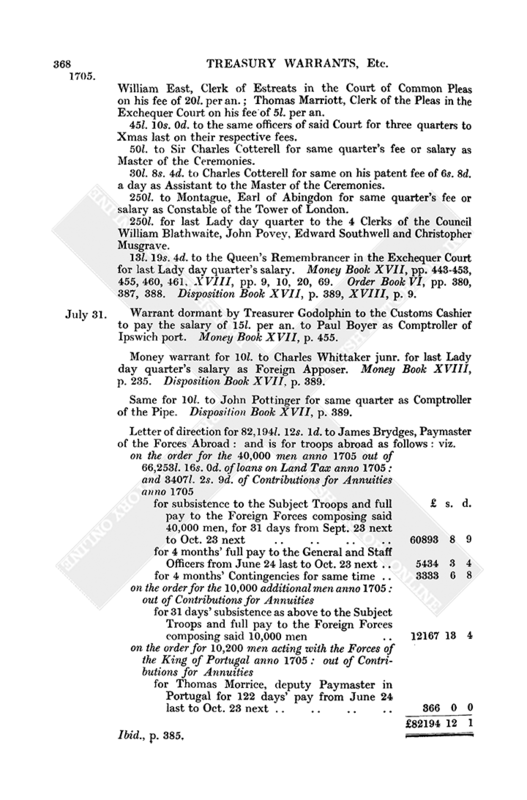 Queen's Warrant Book XXII, pp. 450-1. Money warrant for 100l. to Henry Baker for half a year to Lady day last on his allowance as Solicitor for the Treasury. (Money order dated July 30 hereon). Money Book XVII, p. 439. Order Book VI, pp. 374. Disposition Book XVII, p. 384. Warrant by Treasurer Godolphin to the Principal Commissioners of Prizes to pay 30l. to William Hoe being after the rate of 10 per cent. for his loss and disappointment in his bargain for the Beringham privateer. Prefixing : report to Treasurer Godolphin from the Prizes Commissioners on the petition of said Hoe. The Beringham privateer was exposed by us to public sale at Salters Hall in London on the 25th May last and sold to the petitioner as the highest bidder for 305l. At the time of the sale we had no notice that she was designed for her Majesty's service. But by letter of 27 May, received the 30th May from Mr. Hook, one of the Commissioners for Prizes at Plymouth, we were informed that the Commr. of the Queen's Yard at Plymouth had received order from the Prince [George as Lord Admiral] to take her into his custody for the Queen's service and that she had been delivered up accordingly without our order of delivery. 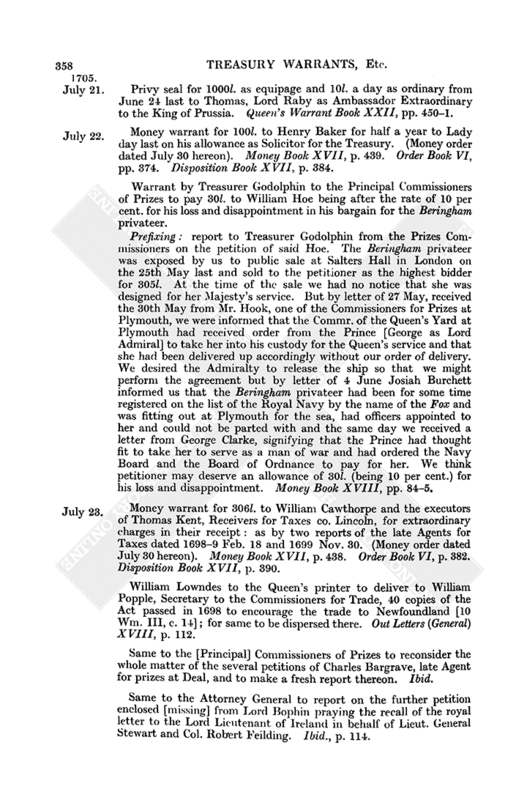 We desired the Admiralty to release the ship so that we might perform the agreement but by letter of 4 June Josiah Burchett informed us that the Beringham privateer had been for some time registered on the list of the Royal Navy by the name of the Fox and was fitting out at Plymouth for the sea, had officers appointed to her and could not be parted with and the same day we received a letter from George Clarke, signifying that the Prince had thought fit to take her to serve as a man of war and had ordered the Navy Board and the Board of Ordnance to pay for her. We think petitioner may deserve an allowance of 30l. (being 10 per cent.) for his loss and disappointment. Money Book XVIII, pp. 84-5. Money warrant for 306l. to William Cawthorpe and the executors of Thomas Kent, Receivers for Taxes co. Lincoln, for extraordinary charges in their receipt : as by two reports of the late Agents for Taxes dated 1698-9 Feb. 18 and 1699 Nov. 30. (Money order dated July 30 hereon). Money Book XVII, p. 438. Order Book VI, p. 382. Disposition Book XVII, p. 390. William Lowndes to the Queen's printer to deliver to William Popple, Secretary to the Commissioners for Trade, 40 copies of the Act passed in 1698 to encourage the trade to Newfoundland [10 Wm. III, c. 14] ; for same to be dispersed there. Out Letters (General) XVIII, p. 112. Same to the [Principal] Commissioners of Prizes to reconsider the whole matter of the several petitions of Charles Bargrave, late Agent for prizes at Deal, and to make a fresh report thereon. Ibid. Same to the Attorney General to report on the further petition enclosed [missing] from Lord Bophin praying the recall of the royal letter to the Lord Lieutenant of Ireland in behalf of Lieut. General Stewart and Col. Robert Feilding. Ibid., p. 114. Same to Surveyor General [of Crown Lands] to report a reasonable rent for the messuage called Moor Hall and 260 acres mentioned in your report on Mr. Strutt's petition. Ibid., p. 123. Treasury reference to Mr. St. John, Secretary at War, of the petition of Thomas Becker, late a private gentleman in the Earl of Oxford's Regiment, shewing that he has served in the army about 30 years but is superannuated and utterly incapable of further service : therefore praying a pension. Reference Book VIII, p. 177. 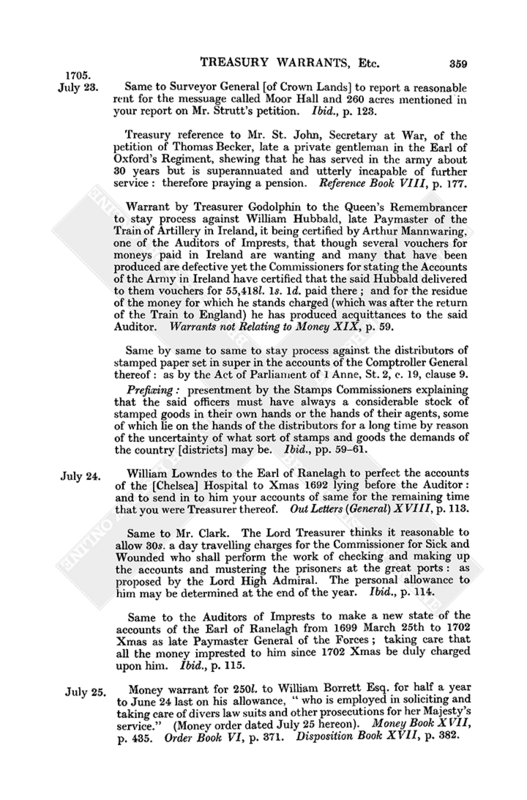 Warrant by Treasurer Godolphin to the Queen's Remembrancer to stay process against William Hubbald, late Paymaster of the Train of Artillery in Ireland, it being certified by Arthur Mannwaring. one of the Auditors of Imprests, that though several vouchers for moneys paid in Ireland are wanting and many that have been produced are defective yet the Commissioners for stating the Accounts of the Army in Ireland have certified that the said Hubbald delivered to them vouchers for 55,418l. 1s. 1d. paid there ; and for the residue of the money for which he stands charged (which was after the return of the Train to England) he has produced acquittances to the said Auditor. Warrants not Relating to Money XIX, p. 59. Same by same to same to stay process against the distributors of stamped paper set in super in the accounts of the Comptroller General thereof : as by the Act of Parliament of 1 Anne, St. 2, c. 19, clause 9. 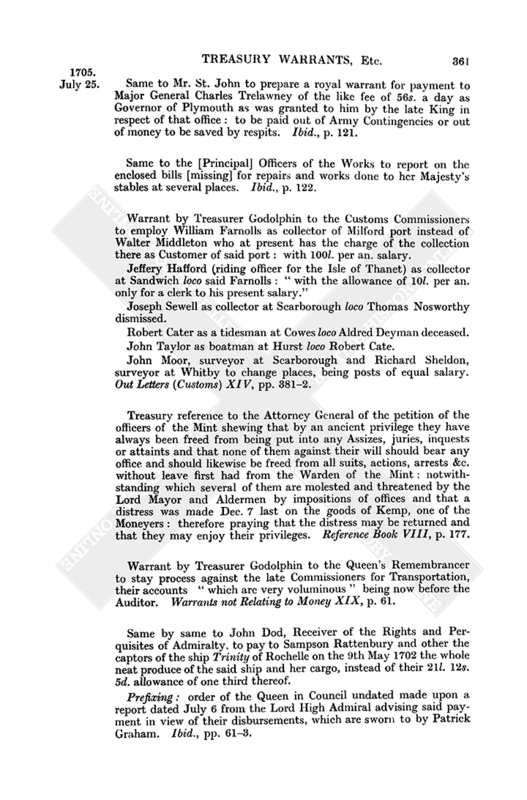 Prefixing : presentment by the Stamps Commissioners explaining that the said officers must have always a considerable stock of stamped goods in their own hands or the hands of their agents, some of which lie on the hands of the distributors for a long time by reason of the uncertainty of what sort of stamps and goods the demands of the country [districts] may be. Ibid., pp. 59-61. William Lowndes to the Earl of Ranelagh to perfect the accounts of the [Chelsea] Hospital to Xmas 1692 lying before the Auditor : and to send in to him your accounts of same for the remaining time that you were Treasurer thereof. Out Letters (General) XVIII, p. 113. Same to Mr. Clark. The Lord Treasurer thinks it reasonable to allow 30s. a day travelling charges for the Commissioner for Sick and Wounded who shall perform the work of checking and making up the accounts and mustering the prisoners at the great ports : as proposed by the Lord High Admiral. The personal allowance to him may be determined at the end of the year. Ibid., p. 114. Same to the Auditors of Imprests to make a new state of the accounts of the Earl of Ranelagh from 1699 March 25th to 1702 Xmas as late Paymaster General of the Forces ; taking care that all the money imprested to him since 1702 Xmas be duly charged upon him. Ibid., p. 115. Money warrant for 250l. to William Borrett Esq. for half a year to June 24 last on his allowance, "who is employed in soliciting and taking care of divers law suits and other prosecutions for her Majesty's service." (Money order dated July 25 hereon). Money Book XVII, p. 435. Order Book VI, p. 371. Disposition Book XVII, p. 382. Money warrant for 34l. 2s. 9d. to Charles Jones, collector of Fowey port, for a moiety of English money which was shipped for transportation and which he seized. (Money order dated July 30 hereon). Money Book XVII, p. 435. Order Book VI, p. 376. Disposition Book XVII, p. 384. Same for 80l. 15s. 10d. to Francis Tyssen [Tysen] for a surplusage on his account ended 1704 Michaelmas as sheriff of cos. Cambridge and Huntingdon : the same arising by payments made by him for the arrests of Thomas Gray, Elias Boswell and Elizabeth Boswell robbers on the highway. (Money order dated July 30 hereon). Money Book XVII, p. 436. Order Book VI, p. 378. Disposition Book XVII, p. 384. 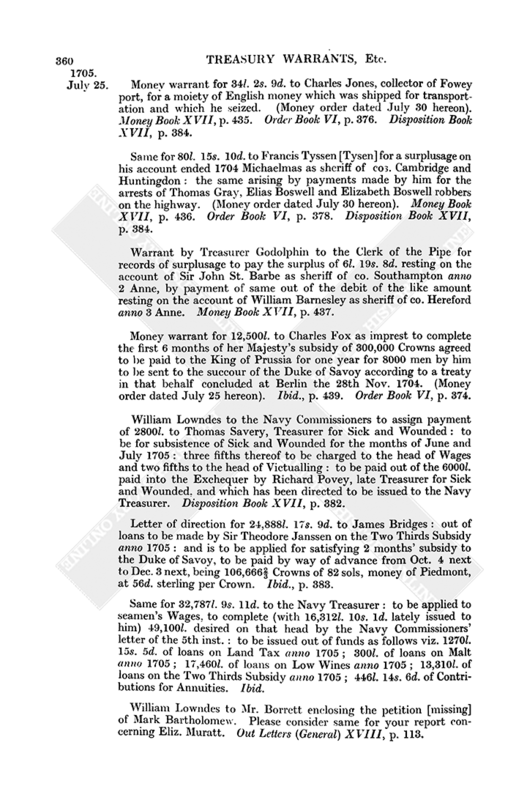 Warrant by Treasurer Godolphin to the Clerk of the Pipe for records of surplusage to pay the surplus of 6l. 19s. 8d. resting on the account of Sir John St. Barbe as sheriff of co. Southampton anno 2 Anne, by payment of same out of the debit of the like amount resting on the account of William Barnesley as sheriff of co. Hereford anno 3 Anne. Money Book XVII, p. 437. Money warrant for 12,500l. to Charles Fox as imprest to complete the first 6 months of her Majesty's subsidy of 300,000 Crowns agreed to be paid to the King of Prussia for one year for 8000 men by him to be sent to the succour of the Duke of Savoy according to a treaty in that behalf concluded at Berlin the 28th Nov. 1704. (Money order dated July 25 hereon). Ibid., p. 439. Order Book VI, p. 374. William Lowndes to the Navy Commissioners to assign payment of 2800l. to Thomas Savery, Treasurer for Sick and Wounded : to be for subsistence of Sick and Wounded for the months of June and July 1705 : three fifths thereof to be charged to the head of Wages and two fifths to the head of Victualling : to be paid out of the 6000l. paid into the Exchequer by Richard Povey, late Treasurer for Sick and Wounded, and which has been directed to be issued to the Navy Treasurer. Disposition Book XVII, p. 382. Letter of direction for 24,888l. 17s. 9d. to James Bridges : out of loans to be made by Sir Theodore Janssen on the Two Thirds Subsidy anno 1705 : and is to be applied for satisfying 2 months' subsidy to the Duke of Savoy, to be paid by way of advance from Oct. 4 next to Dec. 3 next, being 106,6662/3 Crowns of 82 sols, money of Piedmont, at 56d. sterling per Crown. Ibid., p. 383. Same for 32,787l. 9s. 11d. to the Navy Treasurer : to be applied to seamen's Wages, to complete (with 16,312l. 10s. 1d. lately issued to him) 49,100l. desired on that head by the Navy Commissioners' letter of the 5th inst. : to be issued out of funds as follows viz. 1270l. 15s. 5d. of loans on Land Tax anno 1705 ; 300l. of loans on Malt anno 1705 ; 17,460l. of loans on Low Wines anno 1705 ; 13,310l. of loans on the Two Thirds Subsidy anno 1705 ; 446l. 14s. 6d. of Contributions for Annuities. Ibid. William Lowndes to Mr. Borrett enclosing the petition [missing] of Mark Bartholomew. Please consider same for your report concerning Eliz. Muratt. Out Letters (General) XVIII, p. 113. Same to Mr. St. John to prepare a royal warrant for payment to Major General Charles Trelawney of the like fee of 56s. a day as Governor of Plymouth as was granted to him by the late King in respect of that office : to be paid out of Army Contingencies or out of money to be saved by respits. Ibid., p. 121. Same to the [Principal] Officers of the Works to report on the enclosed bills [missing] for repairs and works done to her Majesty's stables at several places. Ibid., p. 122. Warrant by Treasurer Godolphin to the Customs Commissioners to employ William Farnolls as collector of Milford port instead of Walter Middleton who at present has the charge of the collection there as Customer of said port : with 100l. per an. salary. Jeffery Hafford (riding officer for the Isle of Thanet) as collector at Sandwich loco said Farnolls : "with the allowance of 10l. per an. only for a clerk to his present salary." Joseph Sewell as collector at Scarborough loco Thomas Nosworthy dismissed. Robert Cater as a tidesman at Cowes loco Aldred Deyman deceased. John Taylor as boatman at Hurst loco Robert Cate. John Moor, surveyor at Scarborough and Richard Sheldon, surveyor at Whitby to change places, being posts of equal salary. Out Letters (Customs) XIV, pp. 381-2. Treasury reference to the Attorney General of the petition of the officers of the Mint shewing that by an ancient privilege they have always been freed from being put into any Assizes, juries, inquests or attaints and that none of them against their will should bear any office and should likewise be freed from all suits, actions, arrests &c. without leave first had from the Warden of the Mint : notwithstanding which several of them are molested and threatened by the Lord Mayor and Aldermen by impositions of offices and that a distress was made Dec. 7 last on the goods of Kemp, one of the Moneyers : therefore praying that the distress may be returned and that they may enjoy their privileges. Reference Book VIII, p. 177. Warrant by Treasurer Godolphin to the Queen's Remembrancer to stay process against the late Commissioners for Transportation, their accounts "which are very voluminous" being now before the Auditor. Warrants not Relating to Money XIX, p. 61. Same by same to John Dod, Receiver of the Rights and Perquisites of Admiralty, to pay to Sampson Rattenbury and other the captors of the ship Trinity of Rochelle on the 9th May 1702 the whole neat produce of the said ship and her cargo, instead of their 21l. 12s. 5d. allowance of one third thereof. 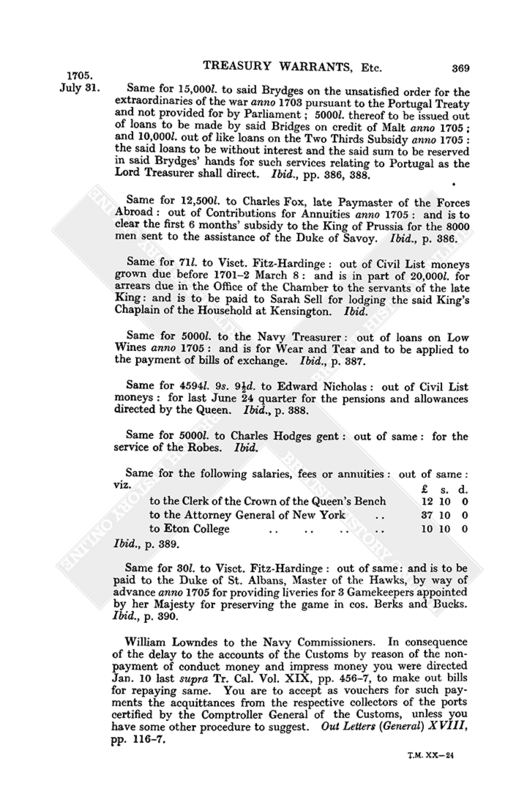 Prefixing : order of the Queen in Council undated made upon a report dated July 6 from the Lord High Admiral advising said payment in view of their disbursements, which are sworn to by Patrick Graham. Ibid., pp. 61-3. Warrant by Treasurer Godolphin to the Queen's Remembrancer to stay process against the Duke of Montague, Master of the Great Wardrobe, his accounts being passed to 1700 Sept. 29, those for the 2 succeeding years being ready for declaration and that for the year 1703 is lately delivered in and under examination. Warrants not Relating to Money XIX, p. 63. Same by same to the Surveyor General of Crown Lands for a particular of the scite of Holt Castle co. Denbigh, the fishing of Tadpoole co. Berks, a house in Butcher Row in Salisbury co. Wilts., and the tithe of flax in Pinchbeck and Weston co. Lincoln ; all in order to a lease to John Bath at rents detailed. Prefixing : said Surveyor's report. The first item contains the scite of Holt Castle, the Castle Ditch, Outward Yard, the Green Court and 2 parcels of land called the Little Park and the Pooles part of which was granted to Edward Hughs anno 19 Eliz. 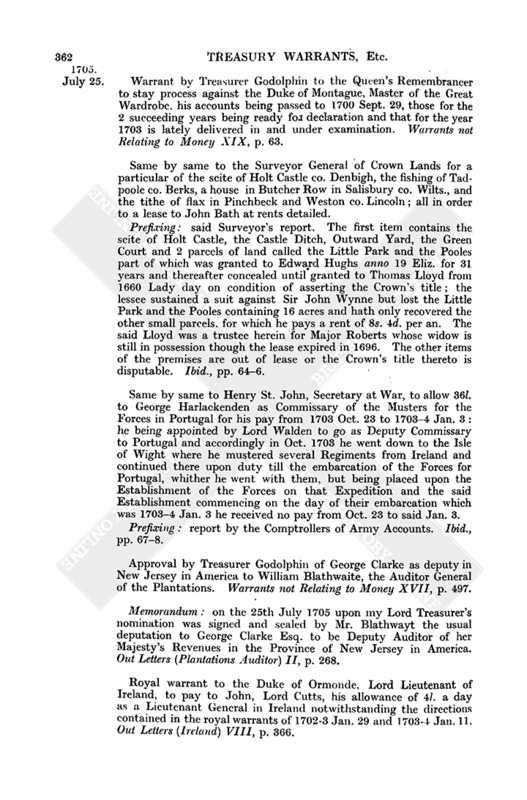 for 31 years and thereafter concealed until granted to Thomas Lloyd from 1660 Lady day on condition of asserting the Crown's title ; the lessee sustained a suit against Sir John Wynne but lost the Little Park and the Pooles containing 16 acres and hath only recovered the other small parcels, for which he pays a rent of 8s. 4d. per an. The said Lloyd was a trustee herein for Major Roberts whose widow is still in possession though the lease expired in 1696. The other items of the premises are out of lease or the Crown's title thereto is disputable. Ibid., pp. 64-6. Same by same to Henry St. John, Secretary at War, to allow 36l. to George Harlackenden as Commissary of the Musters for the Forces in Portugal for his pay from 1703 Oct. 23 to 1703-4 Jan. 3 : he being appointed by Lord Walden to go as Deputy Commissary to Portugal and accordingly in Oct. 1703 he went down to the Isle of Wight where he mustered several Regiments from Ireland and continued there upon duty till the embarcation of the Forces for Portugal, whither he went with them, but being placed upon the Establishment of the Forces on that Expedition and the said Establishment commencing on the day of their embarcation which was 1703-4 Jan. 3 he received no pay from Oct. 23 to said Jan. 3. Prefixing : report by the Comptrollers of Army Accounts. Ibid., pp. 67-8. Approval by Treasurer Godolphin of George Clarke as deputy in New Jersey in America to William Blathwaite, the Auditor General of the Plantations. Warrants not Relating to Money XVII, p. 497. Memorandum : on the 25th July 1705 upon my Lord Treasurer's nomination was signed and sealed by Mr. Blathwayt the usual deputation to George Clarke Esq. to be Deputy Auditor of her Majesty's Revenues in the Province of New Jersey in America. Out Letters (Plantations Auditor) II, p. 268. Royal warrant to the Duke of Ormonde, Lord Lieutenant of Ireland, to pay to John, Lord Cutts, his allowance of 4l. a day as a Lieutenant General in Ireland notwithstanding the directions contained in the royal warrants of 1702-3 Jan. 29 and 1703-4 Jan. 11. Out Letters (Ireland) VIII, p. 366. (Money order dated July 30 hereon). Money Book XVII, pp. 437-8. Order Book VI, pp. 375-6. Disposition Book XVII, p. 384. Same for 12l. 4s. 0d. to the Churchwardens of St. Michaell Cornhill for one year to 1704 June 24 on their perpetuity for the use of their poor. Money Book XVIII, p. 85. William Lowndes to Mr. Borrett enclosing a memorial [missing] relating to the forfeited estate of William Dickenson [in] co. Lancs. Has the Queen any title upon record to the said estate? Out Letters (General) XVIII, p. 115. Same to the [Principal] Officers of the Mint to report on the enclosed proposal [missing] of John Williams for disposing of her Majesty's tin to great advantage, especially his allegation that tin is not likely to be supplied to foreign markets from other places than England even though the price should be raised as he proposes. Ibid. Same to the Customs Commissioners to present John Jones for some employment in the Customs. Ibid., pp. 116. 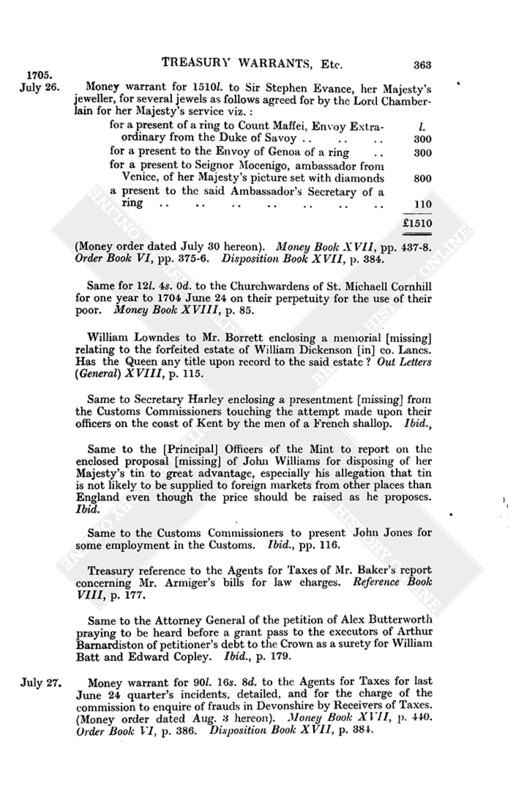 Treasury reference to the Agents for Taxes of Mr. Baker's report concerning Mr. Armiger's bills for law charges. Reference Book VIII, p. 177. Same to the Attorney General of the petition of Alex Butterworth praying to be heard before a grant pass to the executors of Arthur Barnardiston of petitioner's debt to the Crown as a surety for William Batt and Edward Copley. Ibid., p. 179. Money warrant for 90l. 16s. 8d. to the Agents for Taxes for last June 24 quarter's incidents, detailed, and for the charge of the commission to enquire of frauds in Devonshire by Receivers of Taxes. (Money order dated Aug. 3 hereon). Money Book XVII, p. 440. Order Book VI, p. 386. Disposition Book XVII, p. 384. Money order for 32,246l. 17s. 2d. to Thomas Jett gent (who is appointed by the Lord Treasurer to register the unsatisfied debentures on the Act of 2 and 3 Anne c. 19 for enlarging the time for purchasers of forfeited estates Ireland) : to be upon account towards paying one year's interest on such of the said debentures as are or shall be so registered by him : to be paid to him out of moneys arisen out of the said forfeited estates in such proportions as the Auditor of the Receipt shall direct from time to time. Order Book VI, p. 376. 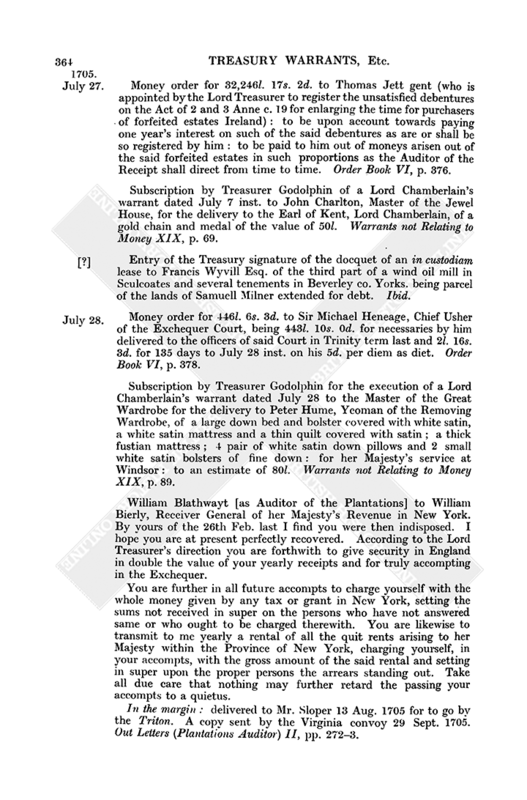 Subscription by Treasurer Godolphin of a Lord Chamberlain's warrant dated July 7 inst. to John Charlton, Master of the Jewel House, for the delivery to the Earl of Kent, Lord Chamberlain, of a gold chain and medal of the value of 50l. Warrants not Relating to Money XIX, p. 69. Entry of the Treasury signature of the docquet of an in custodiam lease to Francis Wyvill Esq. of the third part of a wind oil mill in Sculcoates and several tenements in Beverley co. Yorks. being parcel of the lands of Samuell Milner extended for debt. Ibid. Money order for 446l. 6s. 3d. to Sir Michael Heneage, Chief Usher of the Exchequer Court, being 443l. 10s. 0d. for necessaries by him delivered to the officers of said Court in Trinity term last and 2l. 16s. 3d. for 135 days to July 28 inst. on his 5d. per diem as diet. Order Book VI, p. 378. Subscription by Treasurer Godolphin for the execution of a Lord Chamberlain's warrant dated July 28 to the Master of the Great Wardrobe for the delivery to Peter Hume, Yeoman of the Removing Wardrobe, of a large down bed and bolster covered with white satin, a white satin mattress and a thin quilt covered with satin ; a thick fustian mattress ; 4 pair of white satin down pillows and 2 small white satin bolsters of fine down : for her Majesty's service at Windsor : to an estimate of 80l. Warrants not Relating to Money XIX, p. 89. William Blathwayt [as Auditor of the Plantations] to William Bierly, Receiver General of her Majesty's Revenue in New York. By yours of the 26th Feb. last I find you were then indisposed. I hope you are at present perfectly recovered. According to the Lord Treasurer's direction you are forthwith to give security in England in double the value of your yearly receipts and for truly accompting in the Exchequer. You are further in all future accompts to charge yourself with the whole money given by any tax or grant in New York, setting the sums not received in super on the persons who have not answered same or who ought to be charged therewith. You are likewise to transmit to me yearly a rental of all the quit rents arising to her Majesty within the Province of New York, charging yourself, in your accompts, with the gross amount of the said rental and setting in super upon the proper persons the arrears standing out. Take all due care that nothing may further retard the passing your accompts to a quietus. In the margin : delivered to Mr. Sloper 13 Aug. 1705 for to go by the Triton. A copy sent by the Virginia convoy 29 Sept. 1705. Out Letters (Plantations Auditor) II, pp. 272-3. A like letter to Mr. Fauconier to give security as Receiver General of the Jerseys as below and to charge himself in his accounts with the whole money of any tax ut supra. In the margin : the like notes of despatch, etc., as above. Ibid., pp. 273-4. William Blathwayt to George Clarke, Deputy Auditor of New Jersey, enclosing his deputation for his said office and also a copy of the above letter to Mr. Bierly which I desire you to show to Visct. Cornbury and to comply with his directions thereon. In the audit of the accompts of the revenue in the Jerseys you are to proceed in like manner and according to the same Instructions as in New York. You are to inform Mr. Fauconnier fully of the method of his accounts. 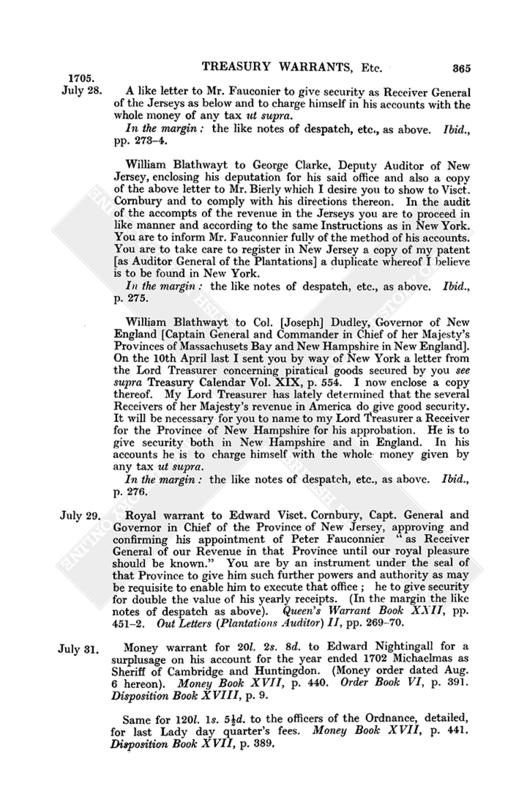 You are to take care to register in New Jersey a copy of my patent [as Auditor General of the Plantations] a duplicate whereof I believe is to be found in New York. In the margin : the like notes of despatch, etc., as above. Ibid., p. 275. William Blathwayt to Col. [Joseph] Dudley, Governor of New England [Captain General and Commander in Chief of her Majesty's Provinces of Massachusets Bay and New Hampshire in New England]. On the 10th April last I sent you by way of New York a letter from the Lord Treasurer concerning piratical goods secured by you see supra Treasury Calendar Vol. XIX, p. 554. I now enclose a copy thereof. My Lord Treasurer has lately determined that the several Receivers of her Majesty's revenue in America do give good security. It will be necessary for you to name to my Lord Treasurer a Receiver for the Province of New Hampshire for his approbation. He is to give security both in New Hampshire and in England. In his accounts he is to charge himself with the whole money given by any tax ut supra. In the margin : the like notes of despatch, etc., as above. Ibid., p. 276. Royal warrant to Edward Visct. Cornbury, Capt. General and Governor in Chief of the Province of New Jersey, approving and confirming his appointment of Peter Fauconnier "as Receiver General of our Revenue in that Province until our royal pleasure should be known." You are by an instrument under the seal of that Province to give him such further powers and authority as may be requisite to enable him to execute that office ; he to give security for double the value of his yearly receipts. (In the margin the like notes of despatch as above). 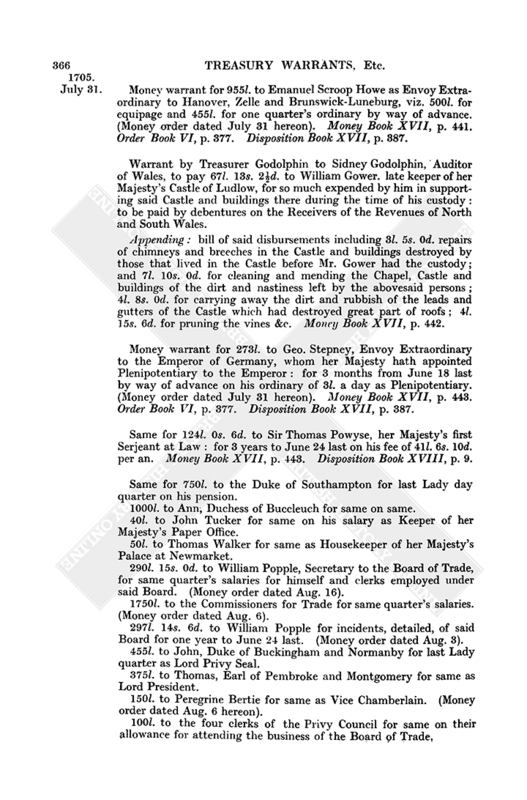 Queen's Warrant Book XXII, pp. 451-2. Out Letters (Plantations Auditor) II, pp. 269-70. Money warrant for 20l. 2s. 8d. to Edward Nightingall for a surplusage on his account for the year ended 1702 Michaelmas as Sheriff of Cambridge and Huntingdon. (Money order dated Aug. 6 hereon). Money Book XVII, p. 440. Order Book VI,p. 391. Disposition Book XVIII, p. 9. Same for 120l. 1s. 5d. to the officers of the Ordnance, detailed, for last Lady day quarter's fees. Money Book XVII,p. 441. Disposition Book XVII, p. 389. Money warrant for 955l. to Emanuel Scroop Howe as Envoy Extraordinary to Hanover, Zelle and Brunswick-Luneburg, viz. 500l. for equipage and 455l. for one quarter's ordinary by way of advance. (Money order dated July 31 hereon). Money Book XVII, p. 441. Order Book VI, p. 377. Disposition Book XVII, p. 387. Warrant by Treasurer Godolphin to Sidney Godolphin, Auditor of Wales, to pay 67l. 13s. 2½d. to William Gower. late keeper of her Majesty's Castle of Ludlow, for so much expended by him in supporting said Castle and buildings there during the time of his custody : to be paid by debentures on the Receivers of the Revenues of North and South Wales. Appending : bill of said disbursements including 3l. 5s. 0d. repairs of chimneys and breeches in the Castle and buildings destroyed by those that lived in the Castle before Mr. Gower had the custody ; and 7l. 10s. 0d. for cleaning and mending the Chapel, Castle and buildings of the dirt and nastiness left by the abovesaid persons ; 4l. 8s. 0d. for carrying away the dirt and rubbish of the leads and gutters of the Castle which had destroyed great part of roofs ; 4l. 15s. 6d. for pruning the vines &c. Money Book XVII, p. 442. Money warrant for 273l. to Geo. Stepney, Envoy Extraordinary to the Emperor of Germany, whom her Majesty hath appointed Plenipotentiary to the Emperor : for 3 months from June 18 last by way of advance on his ordinary of 3l. a day as Plenipotentiary. (Money order dated July 31 hereon). Money Book XVII, p. 443. Order Book VI, p. 377. Disposition Book XVII, p. 387. Same for 124l. 0s. 6d. to Sir Thomas Powyse, her Majesty's first Serjeant at Law : for 3 years to June 24 last on his fee of 41l. 6s. 10d. per an. Money Book XVII, p. 443. Disposition Book XVIII, p. 9. Same for 750l. to the Duke of Southampton for last Lady day quarter on his pension. 1000l. to Ann, Duchess of Buccleuch for same on same. 40l. to John Tucker for same on his salary as Keeper of her Majesty's Paper Office. 50l. to Thomas Walker for same as Housekeeper of her Majesty's Palace at Newmarket. 290l. 15s. 0d. to William Popple, Secretary to the Board of Trade, for same quarter's salaries for himself and clerks employed under said Board. (Money order dated Aug. 16). 1750l. to the Commissioners for Trade for same quarter's salaries. (Money order dated Aug. 6). 297l. 14s. 6d. to William Popple for incidents, detailed, of said Board for one year to June 24 last. (Money order dated Aug. 3). 455l. to John, Duke of Buckingham and Normanby for last Lady quarter as Lord Privy Seal. 375l. to Thomas, Earl of Pembroke and Montgomery for same as Lord President. 150l. to Peregrine Bertie for same as Vice Chamberlain. (Money order dated Aug. 6 hereon). 100l. to the four clerks of the Privy Council for same on their allowance for attending the business of the Board of Trade. 25l. to Sir Charles Cotterell, Master of the Ceremonies, for same quarter on his annuity in lieu of bills. 20l. to the Earl of Ranelagh, Ranger of Cranbourne Chase in Windsor Forest, for one year to Lady day last for providing hay for the deer in said chase. (Money order dated Aug. 6 hereon. Order Book VI, p. 420). 150l. to Sir Francis Windham for last Lady day quarter on his pension. 125l. to Thomas Lane for same on same. 125l. to James Gastigny for same on same. 343l. 2s. 6d. to Charles, Duke of St. Albans for same on his fees as Master of the Hawks. 24l. 3s. 4d. to John Cooke, Clerk of the Foreign Estreats in the Exchequer Court, for same on his fees and allowances. 750l. to the Duke and Duchess Dowager of Grafton for same on their respective annuities. 50l. to Dr. Richard Bentley for same quarter as Library Keeper to her Majesty. 100l. to Rachell and Frances Windham, daughters of Dame Ann Windham for same on their pension. 500l. to Charles, Duke of St. Albans for half a year to June 24 last on his annuity for his logwood pension which expired at Michaelmas 1704. (Money order dated July 31 hereon). 101l. 16s. 5d. to the officers of the Works, detailed, for last Lady day quarter's salaries. 33l. 0s. 10d. to Horatio Moor, Keeper of her Majesty's Tennis Courts, for same quarter's salary. 28l. 15s. 0d. to Jam. Chase, apothecary in ordinary to her Majesty's person, for same on his patent fee. 13l. 6s. 8d. to William Jones, apothecary of her Majesty's Household, for same on his several fees. 20l. 0s. 0d. to Dr. Green, Professor of Phisick in the University of Cambridge, for half a year to Lady day last on his fee or salary. 8l. 6s. 8d. to the Master, Fellows &c. of Emanuell College, Cambridge, for same on their perpetuity. 25l. to Amias Hext for last Lady day quarter on his pension. 10s. a day as Governor and Captain of Windsor Castle. 100l. to Sir David Mitchell, Gentleman Usher Black Rod, for half a year to Lady day last on his allowance in lieu of perquisites. 27l. 7s. 6d. to Lawrence, Earl of Rochester for last Lady day quarter on his fee as Keeper of the New Park at Richmond. 9l. 2s. 6d. to Robert Ford, Keeper of her Majesty's Gardens at Newmarket, for same on same. 20l. to John Dolben and Richard Cann, clerks of the Fines at Ludlow, for one year to Lady day last on their fee. 25l. 1s. 10½d. each to the following as Serjeants at Arms, for last Lady day quarter's fees and board wages viz. Thomas Charnock, Reginald Ryley, Samuell Powell, Joseph Lawson, Thomas Turst, Edmond Williamson, John Templer, Benjamin Gregg, Daniel Gardner, Matthew Hutton. William East, Clerk of Estreats in the Court of Common Pleas on his fee of 20l. per an. ; Thomas Marriott, Clerk of the Pleas in the Exchequer Court on his fee of 5l. per an. 45l. 10s. 0d. to the same officers of said Court for three quarters to Xmas last on their respective fees. 50l. to Sir Charles Cotterell for same quarter's fee or salary as Master of the Ceremonies. 30l. 8s. 4d. to Charles Cotterell for same on his patent fee of 6s. 8d. a day as Assistant to the Master of the Ceremonies. 250l. 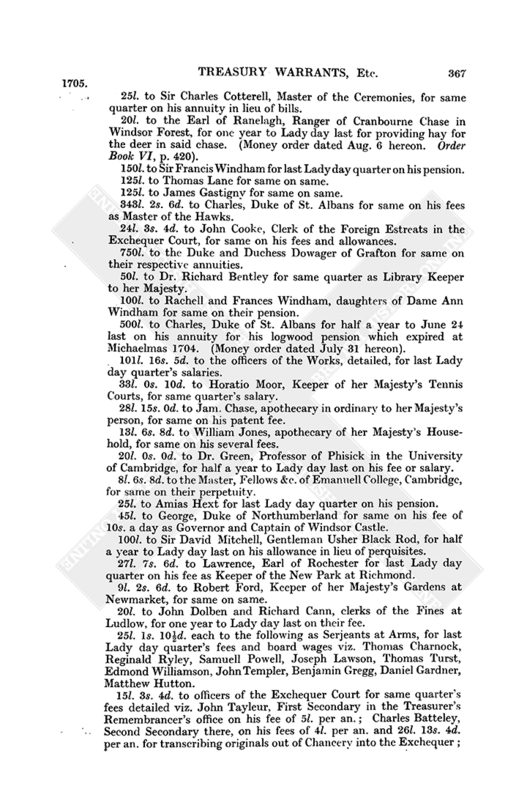 to Montague, Earl of Abingdon for same quarter's fee or salary as Constable of the Tower of London. 250l. for last Lady day quarter to the 4 Clerks of the Council William Blathwaite, John Povey, Edward Southwell and Christopher Musgrave. 13l. 19s. 4d. to the Queen's Remembrancer in the Exchequer Court for last Lady day quarter's salary. Money Book XVII, pp. 443-453, 455, 460, 461, XVIII, pp. 9, 10, 20, 69. Order Book VI, pp. 380, 387, 388. Disposition Book XVII, p. 389, XVIII, p. 9. Warrant dormant by Treasurer Godolphin to the Customs Cashier to pay the salary of 15l. per an. to Paul Boyer as Comptroller of Ipswich port. Money Book XVII, p. 455. Money warrant for 10l. to Charles Whittaker junr. for last Lady day quarter's salary as Foreign Apposer. Money Book XVIII, p. 235. Disposition Book XVII, p. 389. Same for 10l. to John Pottinger for same quarter as Comptroller of the Pipe. Disposition Book XVII, p. 389. Letter of direction for 82,194l. 12s. 1d. to James Brydges, Paymaster of the Forces Abroad : and is for troops abroad as follows : viz. Same for 15,000l. to said Brydges on the unsatisfied order for the extraordinaries of the war anno 1703 pursuant to the Portugal Treaty and not provided for by Parliament ; 5000l. thereof to be issued out of loans to be made by said Bridges on credit of Malt anno 1705 ; and 10,000l. out of like loans on the Two Thirds Subsidy anno 1705 : the said loans to be without interest and the said sum to be reserved in said Brydges' hands for such services relating to Portugal as the Lord Treasurer shall direct. Ibid., pp. 386, 388. Same for 12,500l. to Charles Fox, late Paymaster of the Forces Abroad : out of Contributions for Annuities anno 1705 : and is to clear the first 6 months' subsidy to the King of Prussia for the 8000 men sent to the assistance of the Duke of Savoy. Ibid., p. 386. Same for 71l. to Visct. Fitz-Hardinge : out of Civil List moneys grown due before 1701-2 March 8 : and is in part of 20,000l. for arrears due in the Office of the Chamber to the servants of the late King : and is to be paid to Sarah Sell for lodging the said King's Chaplain of the Household at Kensington. Ibid. Same for 5000l. to the Navy Treasurer : out of loans on Low Wines anno 1705 : and is for Wear and Tear and to be applied to the payment of bills of exchange. Ibid., p. 387. Same for 4594l. 9s. 9½d. to Edward Nicholas : out of Civil List moneys : for last June 24 quarter for the pensions and allowances directed by the Queen. Ibid., p. 388. Same for 5000l. to Charles Hodges gent : out of same : for the service of the Robes. Ibid. Same for the following salaries, fees or annuities : out of same : viz. Same for 30l. to Visct. Fitz-Hardinge : out of same : and is to be paid to the Duke of St. Albans, Master of the Hawks, by way of advance anno 1705 for providing liveries for 3 Gamekeepers appointed by her Majesty for preserving the game in cos. Berks and Bucks. Ibid., p. 390. William Lowndes to the Navy Commissioners. In consequence of the delay to the accounts of the Customs by reason of the nonpayment of conduct money and impress money you were directed Jan. 10 last supra Tr. Cal. Vol. XIX, pp. 456-7, to make out bills for repaying same. You are to accept as vouchers for such payments the acquittances from the respective collectors of the ports certified by the Comptroller General of the Customs, unless you have some other procedure to suggest. Out Letters (General) XVIII, pp. 116-7. William Lowndes to the Customs Commissioners. In your memorial of the 30th ult. you propose that the collection at Minehead be taken from the Customer and that Richard Score junr. be appointed thereto at 40l. per an. salary. Please certify the Lord Treasurer if you have any objection to the present Customer executing the said office in the same manner as his predecessor. Out Letters (General) XVIII, p. 118. 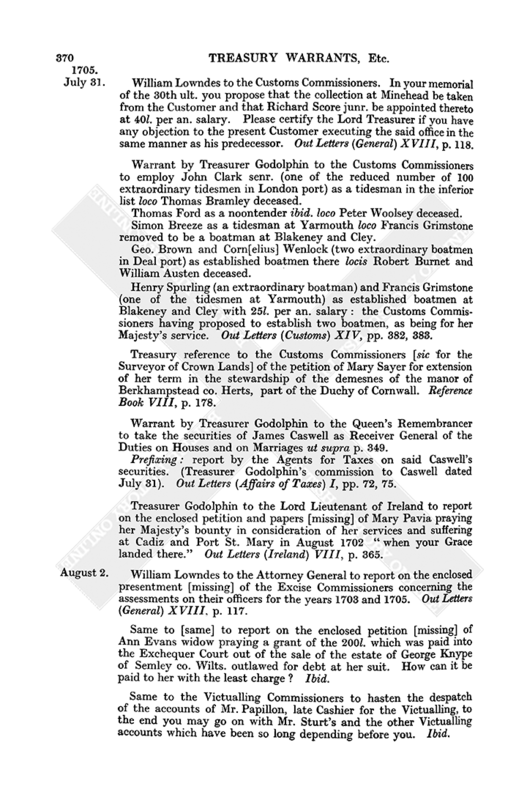 Warrant by Treasurer Godolphin to the Customs Commissioners to employ John Clark senr. (one of the reduced number of 100 extraordinary tidesmen in London port) as a tidesman in the inferior list loco Thomas Bramley deceased. Thomas Ford as a noontender ibid. loco Peter Woolsey deceased. Simon Breeze as a tidesman at Yarmouth loco Francis Grimstone removed to be a boatman at Blakeney and Cley. Geo. Brown and Corn[elius] Wenlock (two extraordinary boatmen in Deal port) as established boatmen there locis Robert Burnet and William Austen deceased. Henry Spurling (an extraordinary boatman) and Francis Grimstone (one of the tidesmen at Yarmouth) as established boatmen at Blakeney and Cley with 25l. per an. salary : the Customs Commissioners having proposed to establish two boatmen, as being for her Majesty's service. Out Letters (Customs) XIV, pp. 382, 383. Treasury reference to the Customs Commissioners [sic for the Surveyor of Crown Lands] of the petition of Mary Sayer for extension of her term in the stewardship of the demesnes of the manor of Berkhampstead co. Herts, part of the Duchy of Cornwall. Reference Book VIII, p. 178. Warrant by Treasurer Godolphin to the Queen's Remembrancer to take the securities of James Caswell as Receiver General of the Duties on Houses and on Marriages ut supra p. 349. Prefixing : report by the Agents for Taxes on said Caswell's securities. (Treasurer Godolphin's commission to Caswell dated July 31). Out Letters (Affairs of Taxes) I, pp. 72, 75. Treasurer Godolphin to the Lord Lieutenant of Ireland to report on the enclosed petition and papers [missing] of Mary Pavia praying her Majesty's bounty in consideration of her services and suffering at Cadiz and Port St. Mary in August 1702 "when your Grace landed there." Out Letters (Ireland) VIII, p. 365.